This 1:10,000-scale (vertical 1:7,500) 3D model of Song Thanh Nature Reserve inQuang Nam Province, Vietnam, was elaborated over the period Apr. -Nov. 2003. It covers an area of 300 sq km and the entire Tabhing commune in the buffer zone of the Song Thanh Nature Reserve. Depicted data reflect the cognitive maps of 70 local people most pertaining to the Ka Tu ethnic group in nine villages of the Tabhing commune and two villages of the neighboring commune of Cady. A total of 30 school Catu children and ten local teachers of a primary and secondary schools participated in the exercise together with 20 trainees from different institutions. The model has been used for the following activities in the framework of the Management of Strategic Areas for Integrated Conservation Project: (i) discussing the boundary of the nature reserve; (ii) planning land use; (iii) allocating forest and forest land; (iv) organizing village groups to protect the forest and identifying their protection areas; (v) developing local regulation for forest protection; (vi) exploiting natural resources in a sustainable way; (vii) developing conversation plan for the commune; (viii) monitoring and evaluating the conservation strategy of the province; (ix) organizing conservation education; and (x) preparing a patrolling plan. The 3D Model has been produced by local stakeholders in the framework of the USAID/WWF US funded (2001-2003) MOSAIC (Management of Strategic Areas for Integrated Conservation) project and facilitated by staff from WWF Indochina Programme and Center for Environment, Tourism and Development. 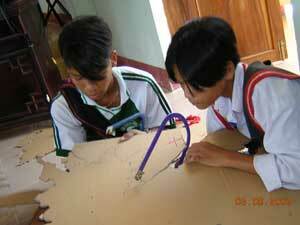 Hardcastle J., Rambaldi G., Long B., Le Van Lanh and Do Quoc Son. 2004. 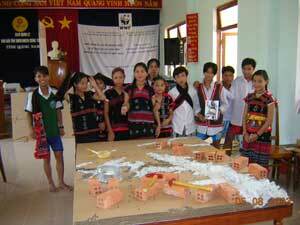 The use of Participatory 3-Dimensional Modelling in community-based planning in Quang Nam province, Vietnam. PLA Notes (2004), Issue 49:70-76, IIED London, UK.